It is interesting to see how STED starts to introduce elements. 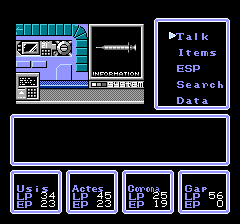 For example, the second town area has enemies weak to fire (your cheapest and first spell on the ESP spell list.) The second town area has enemies who use fire and enemies weak to fire. On the walk to the third town, you can find enemies who use fire and strong to weapons, enemies that poison, and enemies weak to freeze. Unfortunately, you have no way to tell that, say, a Tavie is weak to ice until you try it, and you need to go all the way back to the first town to buy the spell. I probably have Usis' attack a little high at this point in the game. He's supposed to be more of a jack of all trades. 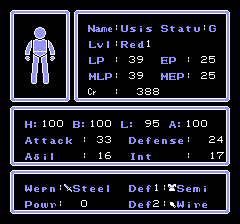 So far, I have two upgraded weapons, and everyone into the Red levels. The total cost for those two weapons was 900 credits. You get 200 credits per walk from the second town to the third, unless if you hit an unusually strong group of enemies. This does not count healing limb damage (about 80 credits, though not needed,) buying batteries (about 10 credits,) upgrading armor (I only have some gauntlets on a few people.) Needless to say, I think the excess amount of grinding is pretty obvious at this point in the game. Actes levels much faster than the other characters. He's supposed to be mostly strong and stupid, but I need to up his attack some more. I’m now getting to the point where an inn stay for a single night doesn’t heal me. On average, an inn stay heals 20 MP, and 10 HP, but enemies can do 14 HP damage easily if they’re using magic. So, the game is introducing the concept of needing several days to recover. A cute touch is that you have an "empty" inn scene if you're not facing the innkeeper. This has a slightly different background than the one behind the innkeeper. I suppose you are getting a distinct feeling of growth due to this steep difficulty curve. After all, hitting the 30’s or the 40’s in HP means that my party can explore with a lot more ease and actually start to have Corona run low on magic. It’s almost making the weapons seem obtainable, since we can earn the required money in only a few more trips around the area. On the other hand, I can’t see anyone tolerating this in a more modern game. Corona's stats are close to what I'd like them to be. Her attack is a little high, but she's basically aimed to be very fast, and a good mage. With some more time, we can finally see one of the major elements in the game! And probably die horribly, since I remember that area being a good spot to die. Or grind for levels.